IMAGE: Contraband Room, United States Customs and Border Protection, JFK International Airport, Queens, New York. 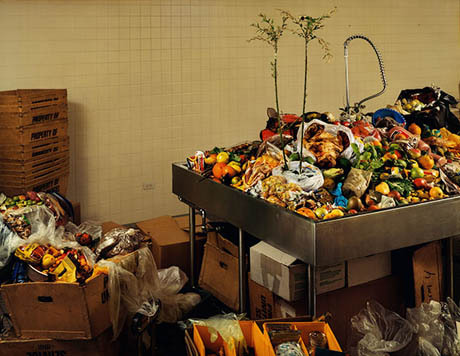 Part of an amazing series by photographer Taryn Simon, this photo shows all the food confiscated from passengers arriving at JFK over a 48 hour period. Among the seized items is a South Asian lime infected with citrus canker. The United States is currently under citrus canker quarantine, with all “interstate movement of citrus plants and plant parts other than fruit” prohibited. As some of you may remember, Geoff and I ran a design studio on this topic last year, from October through December. The resulting work forms the core of the exhibition, and includes an illuminated quarantine fable, an investigation of urban spatial segregation, a tongue-in-check public health campaign (complete with flu-symptom bingo), and a short film inspired by photographer Richard Mosse‘s quixotic journey into the Congo on the trail of the Ebola virus. 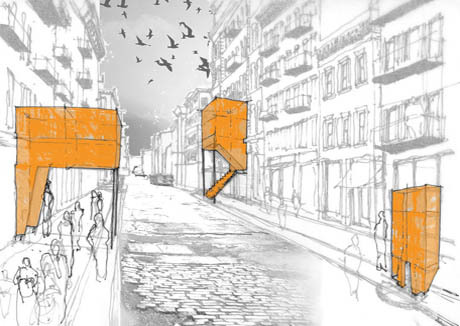 IMAGE: Detail from Front Studio‘s Q-City: An Investigation. 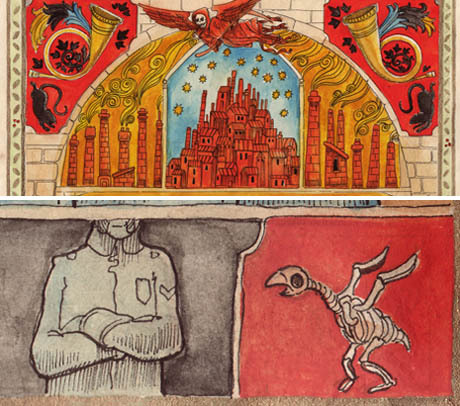 IMAGE: Detail from Joe Alterio’s Pages 179 – 187. Today, though, I’m taking a quick break from painting gallery walls to post a sneak preview of some of the ideas and work in the “Invasion Biology” section of the exhibition. Although quarantine is usually thought of in terms of human or animal diseases, it is also a form of landscape preservation. A plant pandemic can cause major economic damage (phylloxera wiped out thirty percent of French vineyards in the 1870s) as well as millions of deaths: after Phytophthora infestans devastated the potato harvest in the 1840s, Ireland lost almost twenty-five percent of its population. Monocultural farming intensifies the risk that an entire food group could be wiped out by disease. The Cavendish banana is the poster child for disease vulnerability: every single one of the roughly 100 billion bananas consumed annually is a genetic clone. Dan Koeppel, author of Banana: The Fruit That Changed The World, warns that we have only five to ten years before our banana supply is cut off by a variant Panama fungus. A wild scenario? Not when you consider that there’s already been one banana apocalypse. Until the early 1960s, American cereal bowls and ice cream dishes were filled with the Gros Michel, a banana that was larger and, by all accounts, tastier than the fruit we now eat. Like the Cavendish, the Gros Michel, or “Big Mike,” accounted for nearly all the sales of sweet bananas in the Americas and Europe. But starting in the early part of the last century, a fungus called Panama disease began infecting the Big Mike harvest. Koeppel explains that by the 1960s, the disease had spread around the globe. Just in time, a new, resistant banana cultivar – the Cavendish – was developed. Growers spent “billions of dollars” to adjust their production and supply chain to suit the Cavendish’s different growing and ripening requirements. IMAGE: Panama disease, or Fusarium oxysporum, courtesy Keith Weller, USDA. 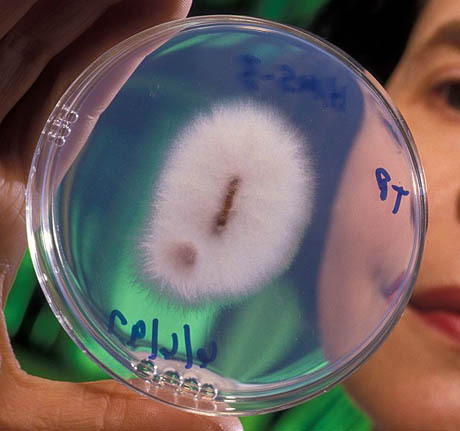 Now, fifty years later, the fungus has mutated and the Cavendish is under threat. Strict banana quarantines are deployed in uninfected areas, to buy time before the disease inevitably strikes. 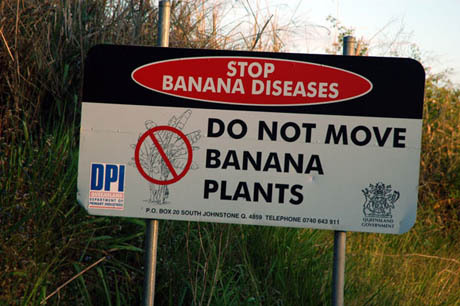 IMAGE: Banana quarantine sign in Northern Queensland, courtesy Brian J. McMorrow. Though plants are generally stationary, pollen and spores can travel for miles on the wind. Many countries enforce strict isolation distances around fields of genetically modified crops, while suspect plants are confiscated at the border and kept behind glass until proven safe (or simply destroyed). However, as the Australian banana quarantine sign above implies, the most dangerous plant disease vector is human trade and travel. For example, the emerald ash borer, which kills infested trees within five years, arrived in the United States hidden in the wood packaging used to ship auto parts, while the poisonous Oak Processionary Moth has recently been discovered in the U.K., brought in on trees imported from Dutch and Belgian nurseries. 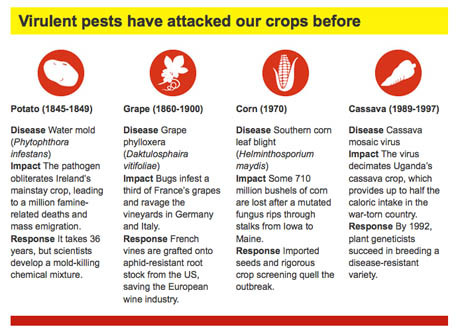 Human-induced climate change is also encouraging several plant pests to extend their range. 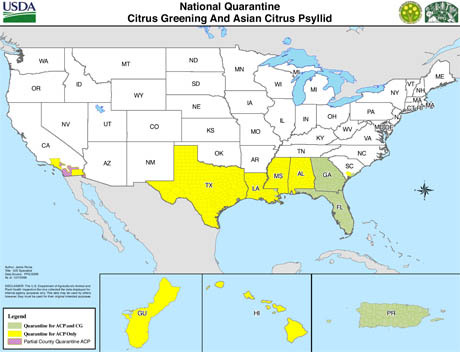 IMAGE: U.S. Quarantine Zones for citrus greening (a bacterial disease) and Asian citrus psyllid. Edible Geography and BLDGBLOG explored the topic of plant quarantine at length in this interview with Sara Redstone, Plant Health and Quarantine Officer at the Royal Botanic Gardens, Kew, published back in November. For the exhibition, we’re also mapping current quarantine zones across the United States. The centrepiece of the “Invasion Biology” section of Landscapes of Quarantine, however, will be an amazing wall-sized infographic by architect and cartographer Thomas Pollman, a GIS expert at the New York City Office of Emergency Management. IMAGE: Detail from Thomas Pollman’s Precious Isolation. 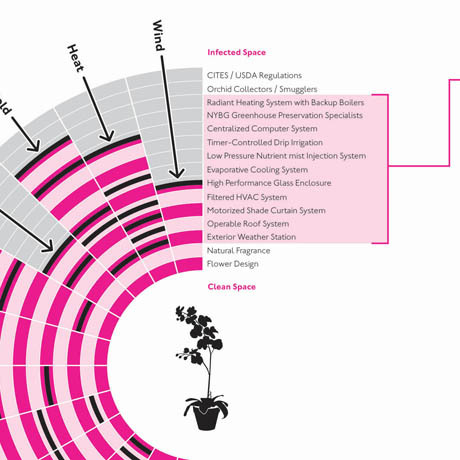 Pollman compares the climate-controlled environments of Plant Rescue Centers, in which illegally imported orchids confiscated at the U.S. border are kept alive in hermetically-sealed greenhouses, to the mobile infrastructure of perimeter defense and personal protection that accompanies the U.S. president on his overseas travels. His research breaks down the costs and labor involved in creating these protective bubbles, in order to defend both endangered orchids and U.S Presidents against the environmental hazards that threaten their survival. Is the President in quarantine? 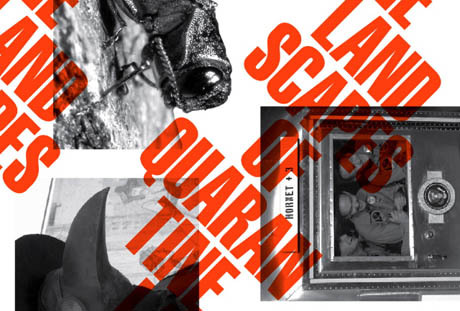 Landscapes of Quarantine will be on display until Saturday, April 17, and there will be a series of quarantine-themed dinners in early April (more details and ticket sales for these will be announced in a few weeks). Our opening reception kicks off at 7 p.m. on Tuesday, March 9; it is free and open to the public (and there will be free beer, generously donated by Brooklyn Brewery). I hope to see some of you there! This entry was posted in Landscapes of Quarantine, Uncategorized. Bookmark the permalink. Trackbacks are closed, but you can post a comment. Thanks, Ashley! Sarah and I will be taking the Foodprint Project on the road soon, so hopefully we’ll have an event near you one day. Thought you might be interested in the illustration posted here – http://localecologist.blogspot.com/2010/03/quarantines-or-brief-global-history-of.html. Love your blog–totally unique and inspiring–I wish I was in NYC to check out these great events you’ve got going on.